Perhaps no other major American railroad enjoyed such a colorful and captivating history like the Denver & Rio Grande Western. It was the idea of General William J. Palmer, a decorated U.S. Army officer of the Civil War, who envisioned something which had never before been attempted; a corridor piercing the heart of the Rocky Mountains. It would link Denver with the Mexican border (following its namesake Rio Grande River for much of the way), reach the San Juan mining district, and head west to Salt Lake City. As a means of reducing costs, Palmer pioneered the 3-foot, narrow-gauge concept. It became a highly popular, it not sustainable, alternative to standard-gauge rights-of-way during the late 19th century. Ultimately, he failed to reach Mexico but is credited with opening the largest and most successful narrow-gauge network in the United States. 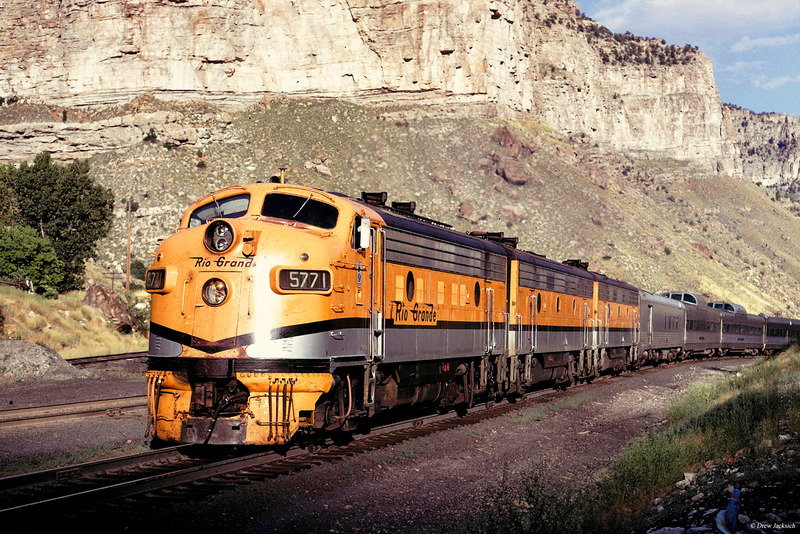 In time, 3-footers proved impractical for interchange and as Rio Grande officials would later realize, its gateway through the Rockies was its most valued asset. After escaping Gould control the D&RGW enjoyed much success, particularly following the World War II era. In 1988, parent company Rio Grande Industries purchased Southern Pacific and retained the more prominent railroad's name. As historian Dr. George Hilton notes in his book, "American Narrow Gauge Railroads," despite losing control of New Mexico's Raton Pass, William Palmer did end up creating much of the railroad he had originally visualized. His interest in the iron horse began early in life when, at the age of 17, he began working for Hempfield Railroad's engineering division. This system, later acquired by the Baltimore & Ohio, was chartered on May 15, 1850 to link then-Wheeling, Virginia with Greensburg, Pennsylvania. After serving with distinction during the Civil War he hired on with the Kansas Pacific. According to James Griffin's book, "Rio Grande Railroad," while helping survey this route into Denver, Palmer became convinced Colorado was tailor-made for a railroad; its eastern plains were highly conducive to agricultural development and the Rocky Mountains were rich in precious metals and coal. After the KP's completion in 1870 he left the company, gathered a few business partners from Denver, and chartered the Denver & Rio Grande Railway on October 27th that year Because of the region's rugged topography they decided upon a narrower, 3-foot gauge right-of-way in an effort to reduce costs and avoid clearance issues. Exposition Flyer: Operated between Oakland, California and Chicago in conjunction with the Burlington and Western Pacific until 1949 (replaced by the CZ). 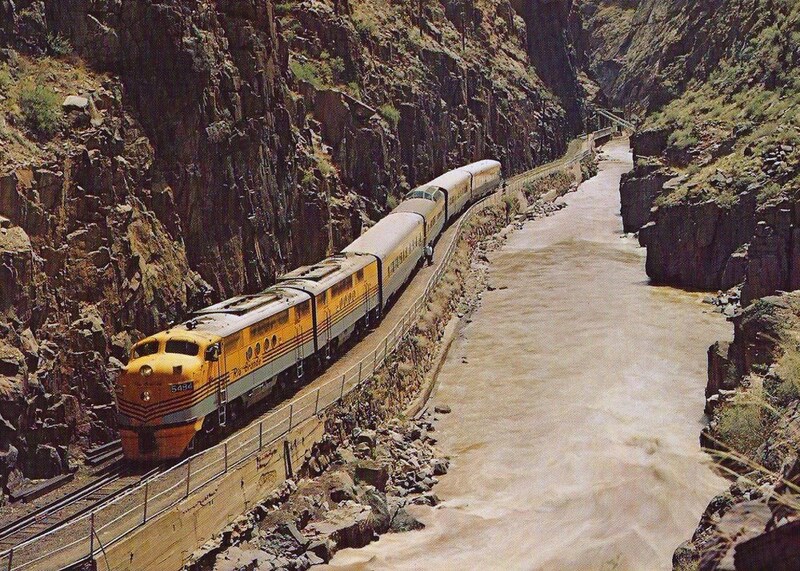 Rio Grande Zephyr: Replacement for the CZ between 1970 and 1983 it operated between Denver and Ogden. They probably did not realize it then but D&RG's promoters spearheaded America's second-most popular gauge. A rail-width of less than 4 feet, 8 1/2 inches had been pioneered in Britain where Isaac W. Boulton of Ashton-under-Lymre built a locomotive capable of utilizing a 2-foot right-of-way in 1861. Afterwards, talks of a smaller gauge sprang up across the United States although it was the D&RG to first implement it on a wide scale. The Rio Grande's success led to an entire new industry during the 1880's. Curiously, as quickly as these railroads appeared they vanished just as rapidly. Most were either abandoned or converted by the World War I era. Two years after the Rio Grande's chartering a committee was formed to study the narrow-gauge concept; known as the National Railway-Gauge Railway Convention the conference was held in St. Louis during June 19-20, 1872. Among the key points discussed was the belief that a three-foot corridor, operating in mountainous environments, could be constructed for one-fifth the cost of major trunk lines like the Baltimore & Ohio, New York Central, and Illinois Central. In addition, across rolling topography, where many railroads were found, cost savings would be about half that of standard. For Palmer, his use of the gauge came purely from an economic and practical standpoint. He sought a three-pronged approach; the primary route would link Denver with El Paso, Texas running along the Front Range in an effort to establish through service into Mexico, a secondary main line would reach the Central Pacific at Salt Lake City/Ogden, and finally branches would infiltrate northwestern New Mexico/southwestern Colorado to serve the San Juan Mountains' booming mining industry. Construction of the main line began out of Denver on July 28, 1871. It took just months to reach the first target, Colorado Springs, with service officially launched to that point on January 1, 1872. Later that year rails were extended to Pueblo while a branch also opened near Cañon City which served local coal mines. Palmer's hesitation to serve this town directly, citing (but not stating) lack of financing, proved a strategic blunder as upset residents, unaware of the monetary issues, sided with the Santa Fe when it tried to reach the Leadville mining district. While the Rio Grande is historically remembered for serving Colorado's legendary silver industry, black diamonds proved a much steadier traffic source that served the railroad well throughout its corporate history. Unfortunately, before Palmer could establish a steady flow of business the financial Panic of 1873 hit. The D&RG never entered bankruptcy but construction was delayed until the economy improved. Work finally resumed in 1876 as crews marched southward, reaching coal mines in the Trinidad/El Moro area (near the New Mexico border) a year later. At the same time, Palmer pressed his railroad westward from Walsenburg, crossed 9,220-foot Veta Pass, and arrived in Alamosa during July of 1877. As the general sought his next move an unexpected problem arose, the Atchison, Topeka & Santa Fe. What blossomed into the West's most famous railroad was already a powerful corporation by the 1870's and was feverishly extending towards the Pacific coast. It had arrived in nearby La Junta on February 16, 1876. A year later, William Barstow Strong was elected vice president and general manager. This iron-willed individual became a constant irritation to Palmer and the two men nearly went to war over slender parcels of ground like the Royal Gorge which could accommodate only a single right-of-way. Keith Bryant, Jr.'s excellent book, "History Of The Atchison, Topeka & Santa Fe Railway," describes their battles in detail. They not only fought for the gorge, situated west of Cañon City, but also previously-mentioned Raton Pass. To tap the lucrative San Juan region the Santa Fe had no choice but to enter the Royal Gorge, which offered the only natural passageway for a suitable grade. This stunning canyon, carved over millennia by the Arkansas River, was hardly wide enough for a single rail line let alone two. Rio Grande crews had already surveyed a route through the area, a fact which did not deter Strong who had the money and commitment to defeat his adversaries. As this was ongoing, he dispatched his second-in-command, Albert Alonzo Robinson, to personally secure Raton, beating Rio Grande's chief engineer, J.A. McMurtrie, to the spot by a mere thirty minutes. Then, the real fight took place through the gorge. The people of Cañon City were still upset that Palmer had not opened service into their town. They took it upon themselves to correct this wrong and formed their own railroad, the Cañon City & San Juan Railway. In 1878, backed by Strong, it was completed from an AT&SF connection at Pueblo to Cañon City. Later that same year it was merged into the Pueblo & Arkansas Valley Railroad, a Santa Fe property. The AT&SF made it twenty miles into the hotly contested gorge, and is credited with constructing the photogenic "Hanging Bridge" over the Arkansas River (which became an often-used location for Rio Grande publicity scenes), before a U.S. Supreme Court order, rendered on April 21, 1879, ended the fighting. The conflict had nearly resulted in a full-scale war with noted law man, Bat Masterson, employed under the Santa Fe to protect construction gangs. There were armed posse on both sides and Rio Grande forces even built forts in an attempt to ward off their rivals. The fighting exhausted Palmer's resources, forcing him to briefly lease his railroad to the Santa Fe. The agreement took effect on December 13, 1878 but lasted mere months before being canceled, following a Colorado court order, on April 27, 1879. The Supreme Court's decision led to the "Treaty of Boston" signed by both parties on March 27, 1880. It ended hostilities and each railroad agreed to stay out of the other's territory (later broken by both). The Rio Grande was also awarded AT&SF's completed work through the gorge, purchased for $1.4 million. The notorious tycoon, Jay Gould, is also credited for ending the fighting; he had effectively gained control of the D&RG leading up to the treaty and worked as an intermediary in negotiating peace. With this dispute over, Palmer turned his attention back towards expansion. He remained focused on a southern route as far as Santa Fe, New Mexico, the western terminus of the busy Santa Fe Trail. It extended south from Alamosa, reaching Espanola on December 30, 1880. Just over six years later the line was finished into the fabled trading post on January 8, 1887. Unfortunately, the "Chili Line" was never particularly profitable. It was riddled with curves as sharp as 22 degrees and grades as steep as 4%. Furthermore, the AT&SF already served Santa Fe over a standard-gauge branch that had been in operation since 1880. 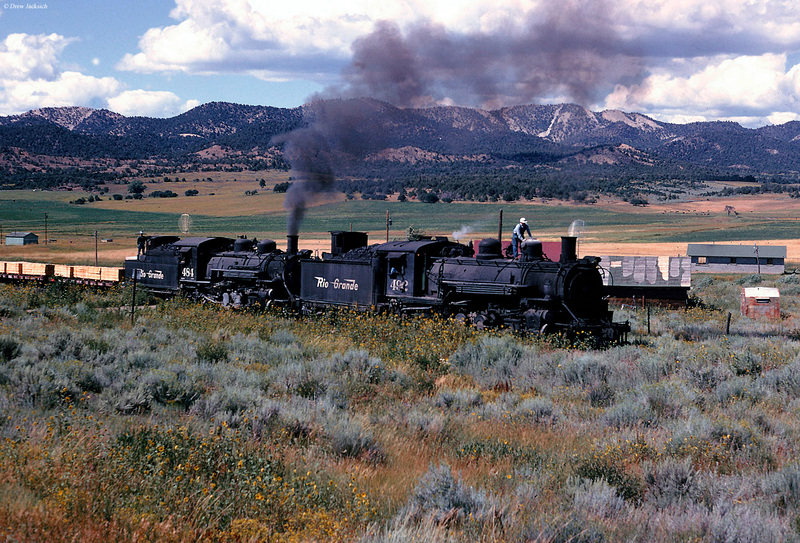 In later years lumber was the primary commodity before Rio Grande had enough and abandoned the line during 1941. The 1880's were a banner decade for the D&RG as it exploded in size; heading west from Antonito it crossed 10,015-foot Cumbres Pass and arrived in Durango on July 27, 1881 (Silverton was reached a year later, offering direct service into San Juan mining district. Some years later, in 1905, a standard-gauge branch extending southward into Farmington, New Mexico was purchased. When the Rio Grande gave up its intentions of converting everything west of Antonito to standard-gauge, the Farmington Branch was changed to narrow-gauge in 1923. ); west of Alamosa another mining branch opened to Creede in 1891; extending beyond Cañon City and passing through the Royal Gorge, construction gangs reached the very important mining camp of Leadville in 1880; this was followed by continuing northward over 10,433-foot Tennessee Pass in 1881 to the small mining community of Red Cliff (when opened, it was highest standard-gauge line in the country). Interestingly, for the time being management elected not to continue towards Utah from this point but, instead, opted for a more southerly route. The decision was driven primarily by additional coal traffic from mines located near Crested Butte. At Salida, the rail-head was extended westward to Gunninson (1881) before it turned north from Montrose. This small town, which later became a junction for the Ouray Branch (completed in 1887 to serve silver mines), sat at about the midway point to Grand Junction (reached on November 22, 1882). A month later, on December 19th, the railroad arrived at the state line but could build no further until corporate charters were received to enter Utah. One of the most unique services a private railroad ever offered was Rio Grande's "Ski Train." It was launched in 1940 by subsidiary Denver & Salt Lake Railway, originally the Eskimo Ski Club's idea to whisk skiers from Denver to the slopes of Winter Park, a popular resort based in Grand County. It was canceled in 1941 due to World War II but reinstated under the D&RGW in 1947. 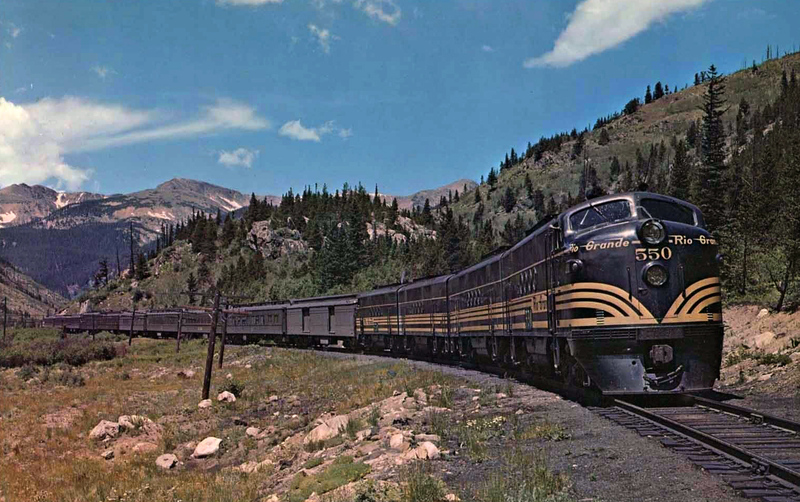 As its popularity grew, the railroad acquired eight heavyweight coaches (built in 1915) from Northern Pacific in 1960. As time passed, the railroad tried numerous times to cancel the train due to rising costs. However, it continued to run and in 1984, new ownership under Philip Anschutz saw the purchase of updated equipment (second-hand cars from VIA Rail, originally built in 1968 by Hawker Siddeley). The "Ski Train" also occasionally ran with much fancier stainless-steel, Budd-built cars from the popular California Zephyr (and later Rio Grande Zephyr). In 1988, Ansco Investment Company, acquired rights to the train which continued to see strong patronage during the next two decades. Then, the service was suddenly canceled on March 29, 2009. According to Trains Magazine's "Newswire," owner Philip Anschutz noted the rising insurance costs, operational issues in sharing the line with Union Pacific, and a weak economy led to the decision. In March of 2015, Amtrak and UP ran a one-day Winter Park Express ski train to celebrate the 75th anniversary of Winter Park. It quickly sold out and an additional service was hosted from from January through March 2017. This was also successful and the carrier has announced an expanded service will offered through 2018. As a result, the Denver & Rio Grande Western Railway was organized on July 21, 1881 with rights to build from the state line to Salt Lake City via Green River, Soldier Summit, and Provo. To aid in this effort, an earlier charter known as the Sevier Valley Railway was acquired along with three other small short lines; the Bingham Canyon & Camp Floyd (BC&CF), Wasatch & Jordan Valley (W&JV), and Utah & Pleasant Valley (U&PV). All were originally built to serve either coal, silver, or copper mines situated south and east of Salt Lake City. The U&PV proved most important; it had opened 55 miles between Springville and Scofield by November of 1879, which was extended further north to Provo in October of 1880. When the D&RGW finished a disconnected segment between Provo and Salt Lake City it used part of the U&PV over Soldier Summit as part of its main line into Colorado. Its first task was to improve the original U&PV alignment over the summit before completing the railroad to the state line on December 19, 1882. Just a few months later, on May 12, 1883, a short branch was finished beyond Salt Lake City to Ogden which established a transcontinental connection with the Central Pacific/Southern Pacific. It seems the Rio Grande was consistently caught up in one bureaucratic mess after another, a situation that persisted well into the 20th century. Fighting with the Santa Fe had only been over for a few years when strained finances led to Palmer resigning the D&RG's presidency on August 9, 1883. He moved on to lead subsidiary D&RGW and was replaced by Frederick Lovejoy. The two went to court over philosophical differences regarding the D&RG's perceived neglected state, which led to the railroads' physical connection being severed just inside the Colorado state line. When the D&RG entered receivership on July 12, 1884, a result of over-exuberant expansion, it elected not to renew its D&RGW lease following its reorganization as the Denver & Rio Grande Railroad on July 14, 1886; the move was made official on July 31st after which time Palmer began improvements on his end. He chartered the State Line & Denver Railway for the purpose of purchasing the D&RG from Grand Junction to the Utah state line. He then merged it with the Denver & Rio Grande Western during June of 1889, forming the Rio Grande Western Railway. 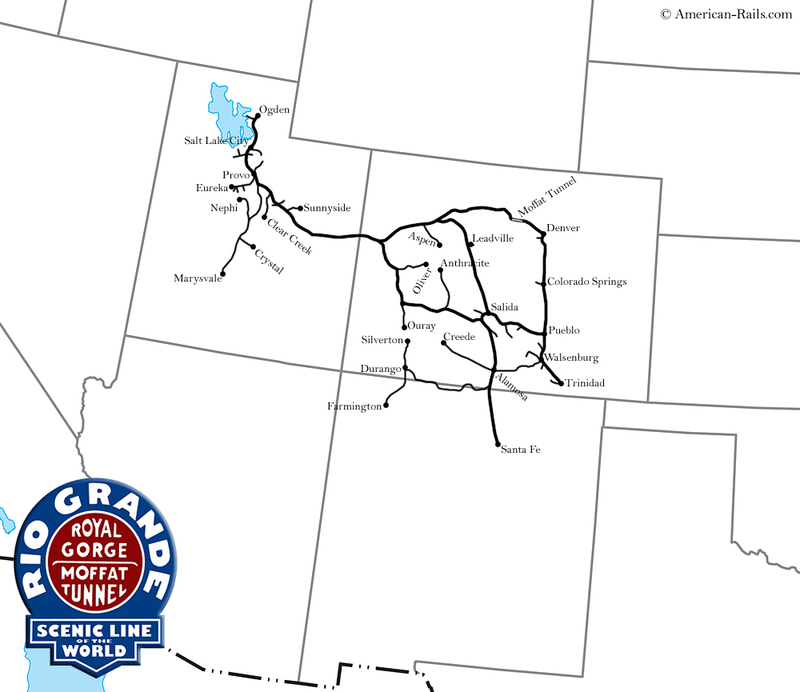 Next, the work of converting the entire network to standard-gauge was carried out; the main line from Ogden to Grand Junction was completed on June 11, 1890 with the branches finished the following year. One final, noteworthy expansion in Utah occurred about a decade later when the Manti Branch was continued down the Sevier River to Marysvale in 1900. During this time the Denver & Rio Grande had also been expanding. Under the leadership of David Moffat, it first built from Red Cliff to Glenwood Springs in an effort to ward off a threat from the standard-gauge Colorado Midland Railway (CM). The line was completed on October 6, 1887 and a month later, reached to the silver camp of Aspen (November 1st). In 1889 rails were pushed further west to Rifle as officials eyed Grand Junction and the opening of a secondary main line. At this point the CM and D&RG elected to work together on the project, finishing the connector on November 14, 1890. While Palmer was converting his the D&RGW, his cross-border competitors were doing the name. The D&RG's narrow-gauge system peaked in 1887 at 1,673 miles. So extensive was its 3-foot network that in 1890 it had only 64 miles of standard-gauge track in operation. This figure rapidly increased over the following decade as major systems wanted to utilize the D&RG as a through route between Denver and Salt Lake City. 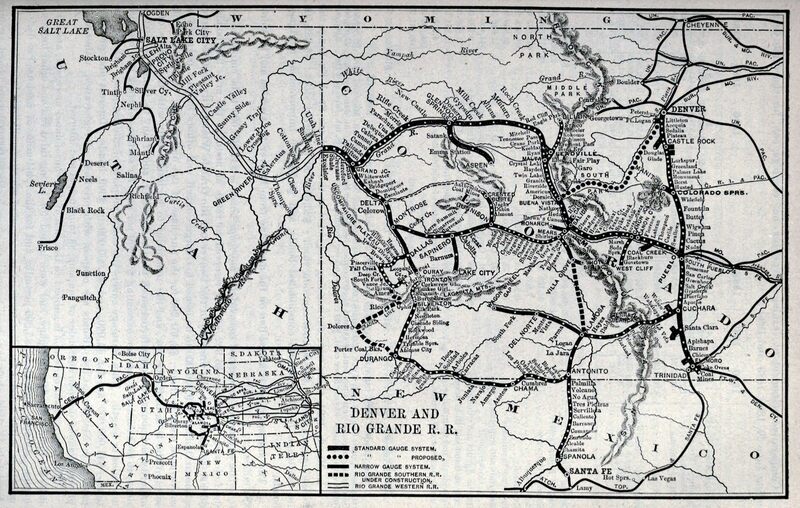 Once officials recognized (particularly after the Sherman Silver Purchase Act was repealed by President Grover Cleveland in 1893) their railroad's potential in this regard, efforts at conversion were hastened; the Denver-Grand Junction section was completed on November 14, 1890 and by 1900 more than 1,000 miles were standard-gauged. This number continued to increase in the succeeding years. Surprisingly, there remained a few holdouts until well after World War II, most notably within the San Juan district west of Antonito which remained unchanged until service ceased in 1967. Afterwards, much of this trackage was sold to the states of Colorado and New Mexico for a tourist attraction. Today they are operated as the Durango & Silverton Narrow-Gauge and Cumbres & Toltec Scenic. In 1896, Gould's empire was handed over to his son, George, who continued his father's transcontinental ambitions. At this time he controlled the Missouri Pacific, Wabash, Western Maryland, Wheeling & Lake Erie, and the Rio Grande. George is credited with reuniting the D&RG and Rio Grande Western under common management by acquiring stock control of the latter in February of 1901. (To simply his corporate structure, Gould merged the Rio Grand Western into the D&RG in August of 1908.) However, his decision to use the two in funding the Western Pacific's construction saddled both with heavy debt for decades to come. The company generally struggled under Gould's control; it not only dealt with crushing financial burdens but was also left to its own affairs resulting in deferred maintenance and relatively poor management. When the financial Panic of 1907 struck, Gould's financing collapsed, and along with it his transcontinental dreams. One by one his properties slipped into bankruptcy, including the Missouri Pacific in 1915 which held some 30% of Rio Grande's stock. 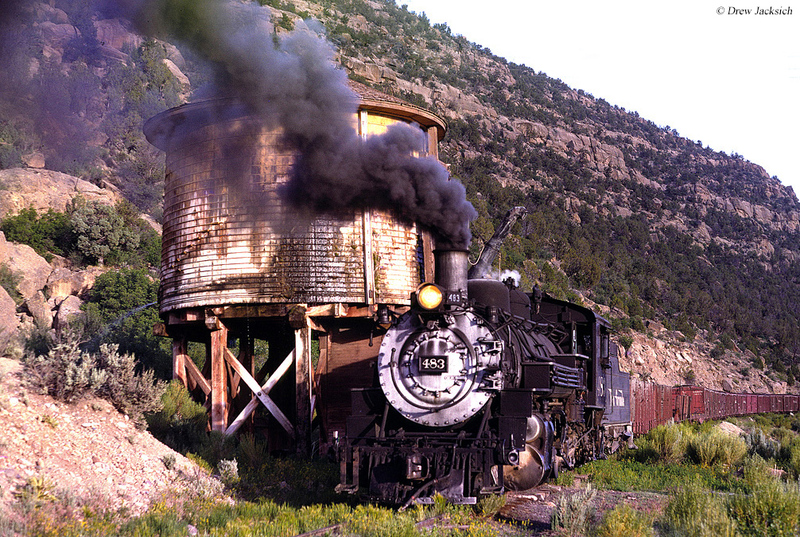 Of Colorado's numerous railroads built to serve the legendary San Juan mining district, one of the more noteworthy was the Rio Grande Southern (RGS). This system was incorporated on November 5, 1889 and promoted by Otto Mears. By that time he had already been involved with various ventures related to the mining industry. The RGS opened from a connection with the D&RG at Durango to another connection at Ridgway (162 miles) on January 2, 1892. Its main line was a zigzag affair; from the north at Ridgway it wound its way through Placerville, headed south, then southwest to Dolores, and turned roughly due east back into Durango. While it was a fascinating operation (making it a popular subject to model), especially its crossing of 10,250-foot Lizard Head Pass, the steep grades and sharp curves made operations extremely difficult. It was a profitable carrier until the Sherman Silver Purchase Act was repealed on June 30, 1893. This caused tonnage to drop by more than half and it entered receivership on August 2, 1893. D&RG's president, Edward Jeffrey, was made receiver which effectively gave Rio Grande control. Rio Grande Southern exited receivership on December 1, 1895 and despite the traffic losses did relatively well until the markets crashed in October of 1929. This led to another bankruptcy on December 11th and an end to Rio Grande's involvement. It failed to escape receivership for more than 20 years as the courts did their best to keep the company solvent. It survived on government loans and remaining zinc mining until operations ceased entirely on December 17, 1951. The following August and September its network was dismantled. Then, the United States Railroad Administration took over the industry, made effective at noon on December 28, 1917. The directive was ordered by President Woodrow Wilson in response to fears of national gridlock. Unfortunately, the government did no better at maintaining fluid operations than the private sector, resulting in rundown equipment and inadequately maintained equipment. This issue, coupled with its crushing debt and complicated corporate structure, led to the D&RG's receivership on January 25, 1918. The Transportation Act made effective February 28, 1920 returned the industry to private ownership. The Denver & Rio Grande Western Railroad was subsequently organized to acquire the D&RG's assets, taking formal control on August 1, 1921. Financial struggles continued and a second bankruptcy occurred on July 21, 1922. It was again reorganized on October 29, 1924 but this time carried the same name. As the company's situation remained uncertain it built one of the country's great engineering feats, thanks largely to funding provided through the city of Denver and federal Reconstruction Finance Corporation loans. In 1930, the D&RGW acquired a significant interest in the Denver & Salt Lake Railway (D&SL), a project initially launched by David Moffat in 1902 to build a secondary route from Denver to Salt Lake City. He had run out of money by 1913 having only reached Craig, Colorado. 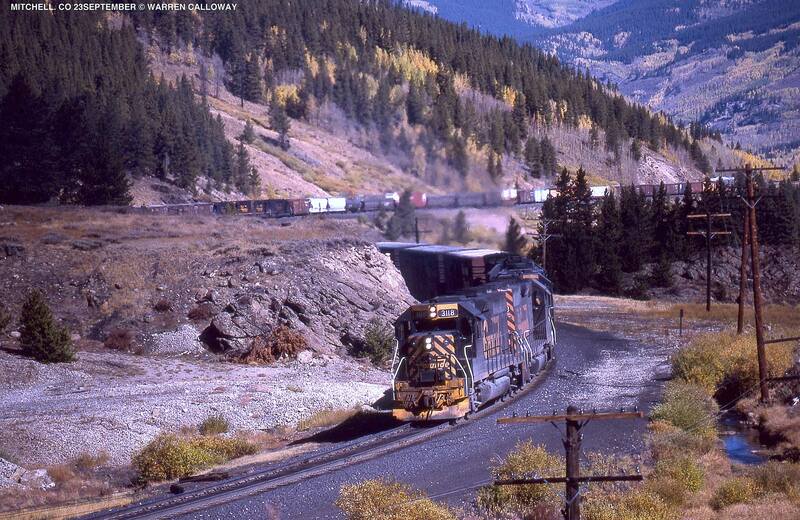 According to Mike Schafer's took, "Classic American Railroads," part of the D&SL crossed 11,680-foot Rollins Pass. It was situated somewhat northwest of Denver and was only surmounted via a series of tortuous switchbacks, carrying grades as high as 4%. So difficult was this stretch that 23 miles of railroad were required to connect two points just 8 miles apart. To improve operations the city agreed in 1922 to help fund a new tunnel under James Peak. Following six years of work the $18 million project was completed in 1928 and named for D&SL's founder. Moffat Tunnel was 6.1 miles in length and reduced the trip from hours to a mere 15 minutes. After the Rio Grande gained control it completed a short connector in 1934 known as the Dotsero Cutoff which ran from D&SL at Bond to D&RGW's Tennessee Pass main line at Dotsero. This essentially completed Rio Grande's modern network which contained 2,569 route miles (including standard, narrow, and third-rail gauge). Alas, with the ongoing depression and lingering monetary troubles another bankruptcy occurred on November 1, 1935. * Built as narrow-gauge Consolidations for Rio Grande Southern. Despite the rugged topography the Rio Grande possessed an impressive operation cutting through the heat of the Rockies. 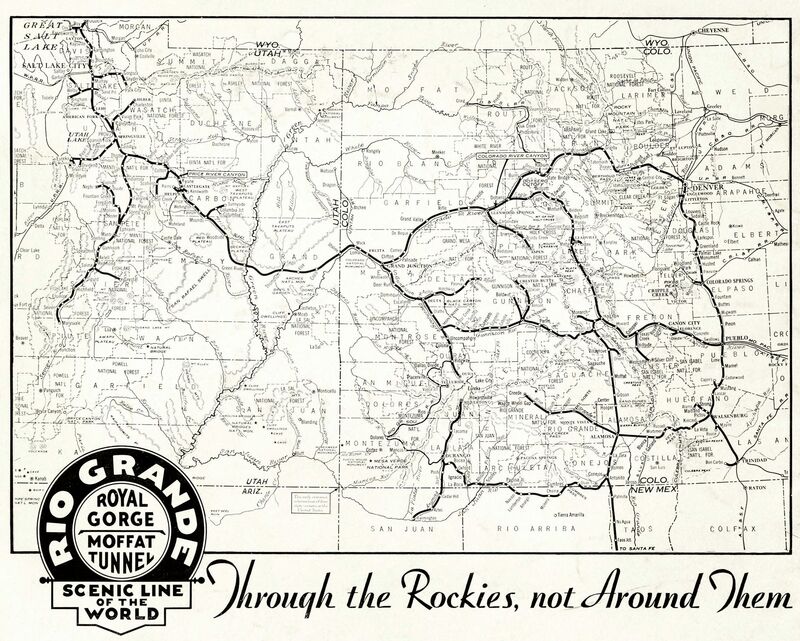 The road was true to its slogan, "Through The Rockies, Not Around Them" as it boasted three main lines across the region; over Moffat Tunnel, through the Pueblo gateway crossing Tennessee Pass, and the original main line to Grand Junction via Salida/Montrose. (It nearly opened a fourth route from Antonito to Montrose, via Durango but topography between the rail-heads at Ouray and Silverton [only 23 miles apart] proved too rugged to support a manageable alignment.) The company financially improved throughout the 1930's, particularly during World War II's traffic blitzkrieg. It was finally reorganized on April 11, 1947 carrying the same as before but permanently separated from the Missouri Pacific and Western Pacific. Afterwards, it enjoyed several decades of prosperity. In 1949 it launched one the best remembered streamliners of all time, the California Zephyr, in conjunction with the WP and Chicago, Burlington & Quincy. 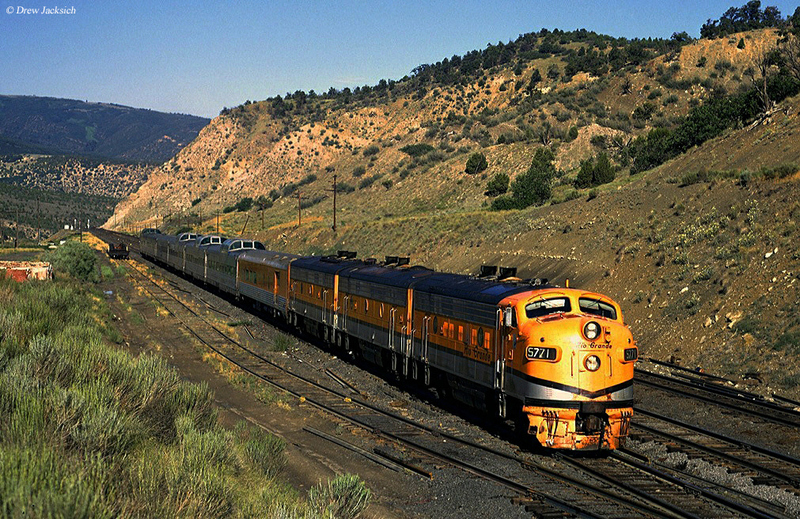 After its cancellation in 1970 the Rio Grande continued to host the service as the Rio Grande Zephyr from Denver to Salt Lake City. This lasted until 1983 when it finally turned its equipment over to Amtrak. After purchasing an ailing Southern Pacific in 1988, Rio Grande Industries (Rio Grande's parent company) slowly integrated the smaller Denver & Rio Grande Western into the much larger SP. By the time Union Pacific purchased Southern Pacific in 1996 the D&RGW had largely disappeared. 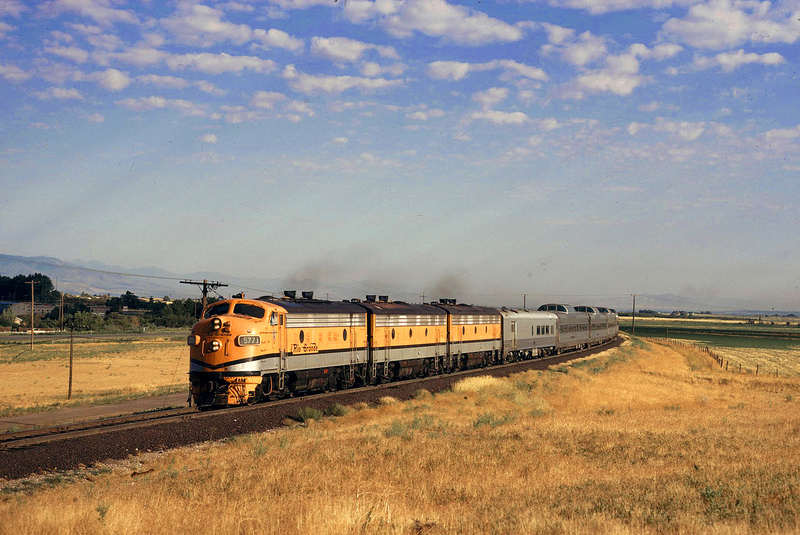 Today, its Denver - Salt Lake City main line remains an important component under Union Pacific while several other segments, like those described, are popular tourist attractions.